With the economic turmoil, it has been said that gambling regulation (and taxation) may help the government to raise revenues. A bill of law is currently under discussion in the Congress, and a final decision on the matter is expected in 2017. Contests for advertising purposes must be authorised by the Ministry of Finance, either by Caixa Econômica Federal (Caixa), Brazil’s largest state-owned public bank that is under the supervision of the Ministry of Finance, or by the Secretariat of Economic Monitoring (SEAE), depending on the company’s activities. Lotteries can only be state-owned. Caixa was granted the control of the lotteries as a result of Decree No. 50,954 of 14 July 1961, which cancelled all lottery licences granted to the private sector. Caixa holds the monopoly on the regulation and operation of federal lotteries. State lotteries must comply with the gaming standards set forth by Caixa, and may not create new gaming products. The free distribution of prizes is regulated by the Ministry of Finance and is subject to previous authorisation by Caixa or by the Secretariat for Economic Monitoring (SEAE), depending on the operator. According to Article 10 of the same law, all companies that pay prizes are obligated to identify their clients and keep records for at least five years. Brazil has been a member of the Financial Action Task Force since 2000. Brazil has also been a member of the Financial Action Task Force of South America since 2000. Senator Fernando Bezerra presented several versions of the draft, the latest on 4 November 2016. On 9 November, the Commission of the Senate finally approved Bill of Law 186/14, and on 14 December a request from Senator Magno Malta was approved. The Bill will now be analysed by the Constitution and Justice Commission (CCJ) of the Senate. During the ICE Totally Gaming Conference in London in February 2017, the SEAE confirmed that officials were drafting a Bill of Law to be presented by the government during the first half of the year, to regulate sports betting. Once a bill of law is approved in the floor of one of the houses, it will have to be approved by the other house. If amended, it will need approval by the house of origin before being subject to the President’s sanction. We do not expect this process to be completed until the end of 2017. This delay is a consequence of the unprecedented political crisis that has arisen from the corruption scandals involving several important politicians, including the former and the current presidents. The current President, Michel Temer, was trying to push the social security, labour and tax reforms for legislative approval in the first semester of 2017 and the gaming bill was supposed to be voted on in the second semester. Now, because of the latest scandal involving the President and several congressmen, there may be another impeachment process that could delay the gaming regulation even further. Hopes are high for gambling regulation in Brazil in 2017. Unfortunately, political turmoil, resulting from the impeachment of President Dilma Rousseff and several corruption scandals involving politics, has complicated matters. 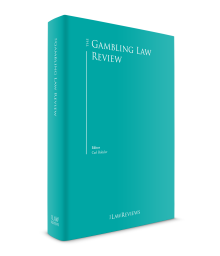 As it is a sensitive matter, gambling provokes passionate discussions and any decision on its regulation, especially at this point in time, will take into consideration not only the financial aspects but also the political repercussions. As the social security and labour reforms are now a priority for the government, it will probably not sponsor any controversial matters, including gambling, until those reforms are approved. Lotex, an instant lottery, was created by Law No. 13,155 of 4 August 2015, and Law 13,262 of 22 March 2016 redefined the object of Lotex to include events of great popular appeal, commemorative dates, cultural references, licensing of brands or characters, and other graphic and visual elements in order to increase its commercial appeal. This change was significant and represents a major advance for instant lotteries in Brazil. The second step was the designation of the Brazilian Development Bank (BNDES) as responsible for executing and monitoring the privatisation process of Lotex – replacing Banco do Brasil, which had originally been assigned to this task. In this context, BNDES issued a bidding notice at the end of 2016 for the contracting of specialised technical services necessary for the privatisation of Lotex. The purpose of this procurement process was (1) economic and financial evaluation of Caixa Instantânea S/A, (2) analysis of the regulatory framework of the lottery sector, (3) elaboration of the privatisation model, (4) preparation of the business plan, (5) proposition of the regulatory model, and (6) legal advice and other services necessary for the privatisation process. The bidding was completed and the BNDES signed an 18-month contract with the Consortium led by Ernst & Young. At the time of writing, the privatisation of Lotex is pending economic and financial evaluation, the number of licences has not been defined and the design of the bidding process has not been established. The expectation of the government and the operators of the sector is that in 2017 the bidding notice for the privatisation of Lotex will be launched. In the meantime, several international companies are trying to position themselves in Brazil. 1 Luiz Felipe Maia is founding partner at FYMSA – Franco, Yoshiyasu, Maia, Simões & D’Alessio Advogados.